Nearly all of Les Filles de Les Mares is on my design wall. Well, I’m done with the blocks for Les Filles de Les Mares, and now I am putting together the top. 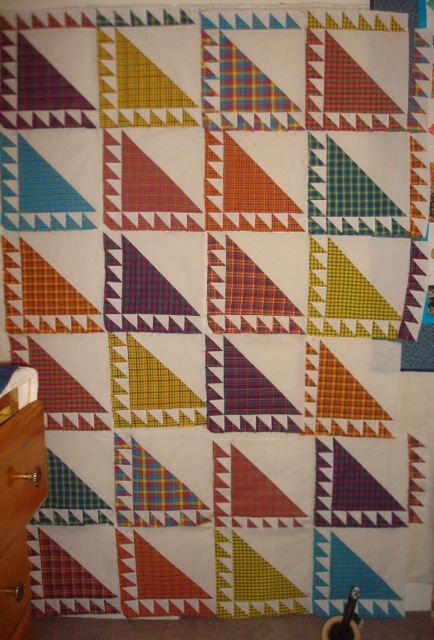 As you can see in the photo I see have a couple more strips of triangles to finish. But what I’m mostly thinking about is: does it need borders? And, if so, what kind? 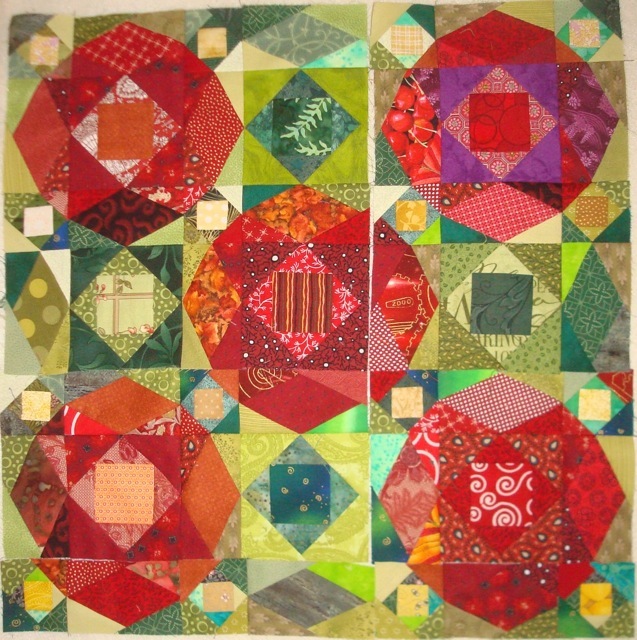 So, this week I will be putting together the “main quilt top” and thinking about borders. A scan from a book does not necessarily make the best illustration for this quilt. Go check out the book for yourself! I was just so intrigued by this quilt not only because of the fabric the quilter used to piece it (silk wedding kimono, obi, etc.) but also because it looked like Tumbling Blocks, but was obviously pieced like a Log Cabin block. 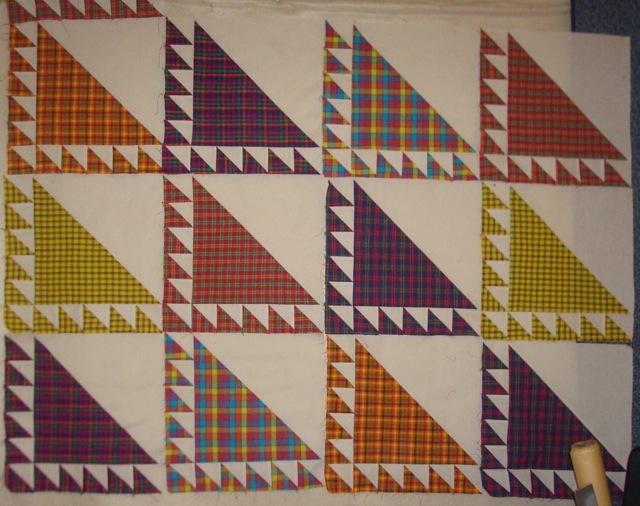 This is the block on which the quilt was based. Upon closer inspection of the photograph, (oh, how I wish I had a better one to study… or, even better, a chance to look at the actual quilt itself!) 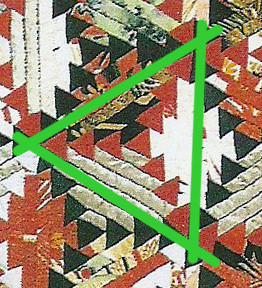 I decided it was based on a triangle, not a diamond (as would be the case in a traditional Tumbling Blocks quilt. 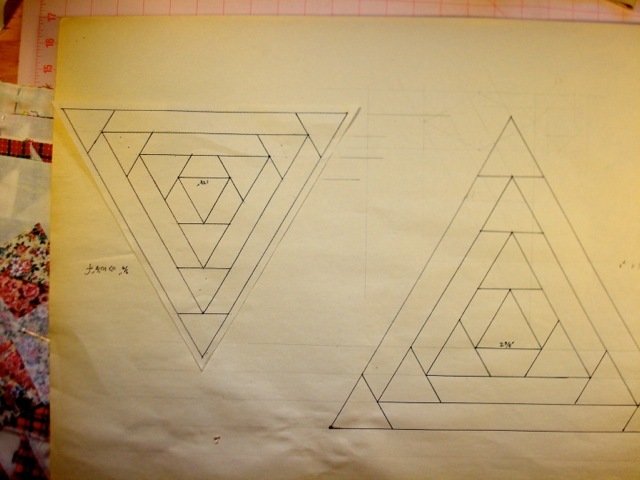 From there, it was just a matter of getting the proportions right and drawing up the pattern. I will probably foundation-piece this quilt. And, of course, I haven’t named it yet. I may pick something from my limited Japanese vocabulary. As, you know I am a HUGE fan of doing a little quilting every day. If you don’t quilt a little every day, February is the perfect month to experiment. For one thing, it’s short. 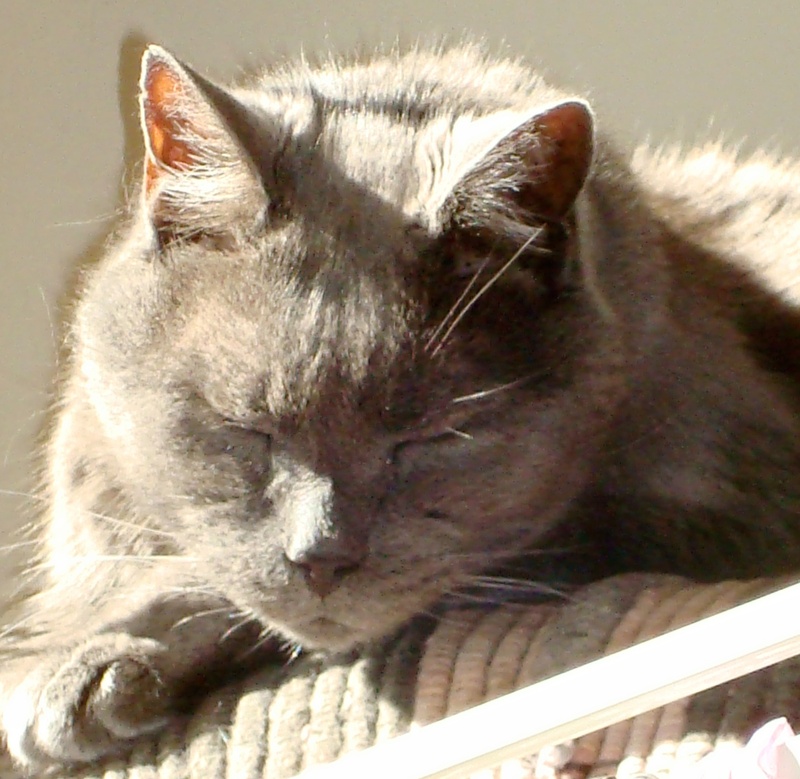 Stuck Indoors Until Spring… I wish! Well, Thursday saw me writing, just not a blog post. Instead of being creative in my writing, I moved on to my documentation project. I am documenting my volunteer job with my Quilt Guild. I am their web manager. From just designing and updating the web site, the job has expanded over the 5 years I’ve been doing it, and now that I want to take some time off (to quilt and to write), I am kind of astonished at how much information I have to impart to the person taking over. The piecing of Everything’s Coming Up Roses is now finished. It goes to its “new home” on Monday where it can be finished and (I hope) enjoyed. I also had some design projects to contemplate (one of which I finished.) So, not a lot of quilting this week. 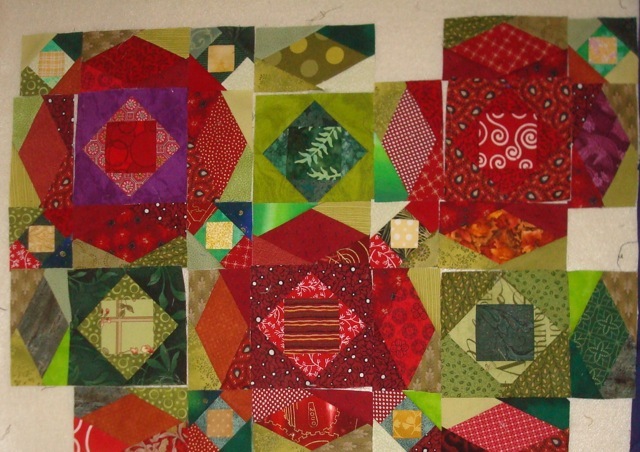 It would have been a great week for quilting since the weather has been in the lower teens (Farenheit) and single digits. I almost wish I had set up Starina to hand quilt months ago when I thought of it. Now, of course, it’s Saturday, and there is no food in the house. After days of hiding out and doing “inside stuff” (mostly cleaning), I have a ton of trash to haul to the dumpster. I guess I can’t put off facing the “arctic hinterlands” of New England any more. 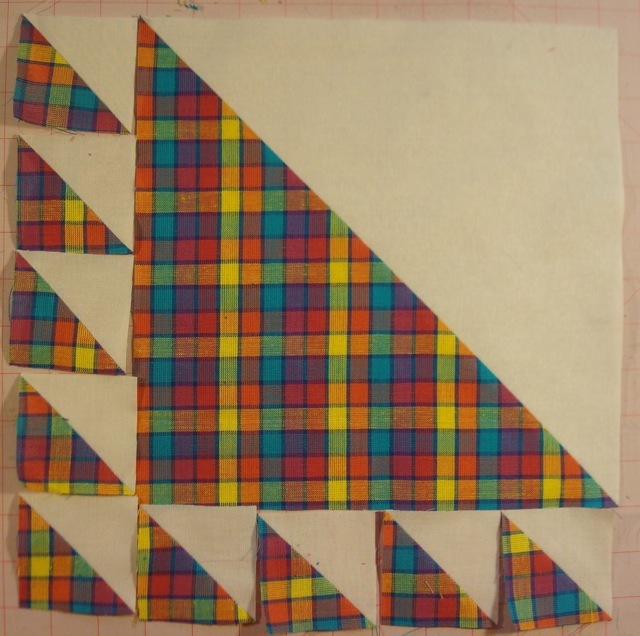 Since Everything’s Coming Up Roses is, essentially, done, and the blocks Les Filles… will be done before February, I am working on a new design based on equilateral triangles for Drop and Give Me 20. 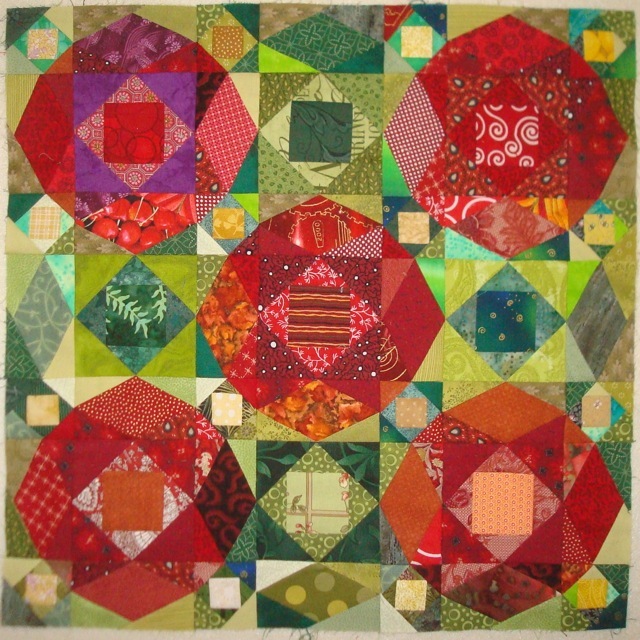 This one is based on a quilt by Japanese quilter Isako Murakami. 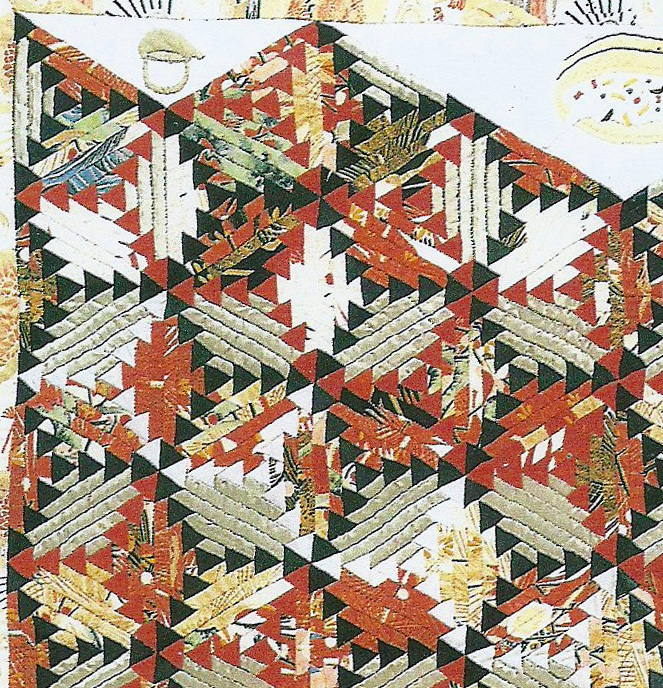 I can’t find a picture of it online, but the book I borrowed from the Guild Library (Japanese Quilts by Jill Liddell and Yuko Watanabe was published in 1988 before pictures were posted to the internet as a matter of course. And, of course, I have to draft it. So, pictures of it next week, I promise! All the blocks are made for Everything’s Coming Up Roses, and I’m putting it together. I’m actually posting this on a Thursday! I’ve actually named the Storm at Sea/Rose quilt and all the blocks are done. It’s on track to be completely pieced by our Guild meeting. I’ve started on another quilt using the bright homespun FQs I bought over the holidays. It’s an easy block with all triangles. So easy I can’t find the name of it in my reference books. 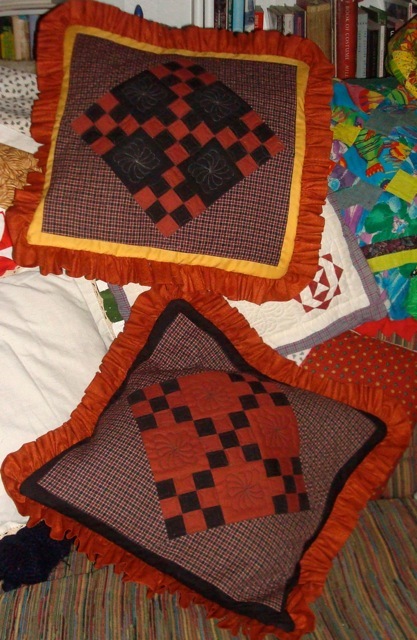 I sent the pillow shams I made as FMQ practice to my mom… and she still likes them up close, although she says she would have preferred them without the ruffles. I have made a “good start” in documenting the web site for my Guild… I won’t bore you with the details. I thought this block was called “Ladies of the Lake,” but I looked it up and that isn’t it. Any one know what it’s really called? How do I do all this stuff, you ask? Well, at the very beginning of my blog (way back in June of 2012) I shared my secret: I try to do a little quilting every day. So, if you want to try this out on your own, February is the perfect time because Beth of EvaPaige Quilt Designs is running Drop and Give Me 20 (DaGM20). 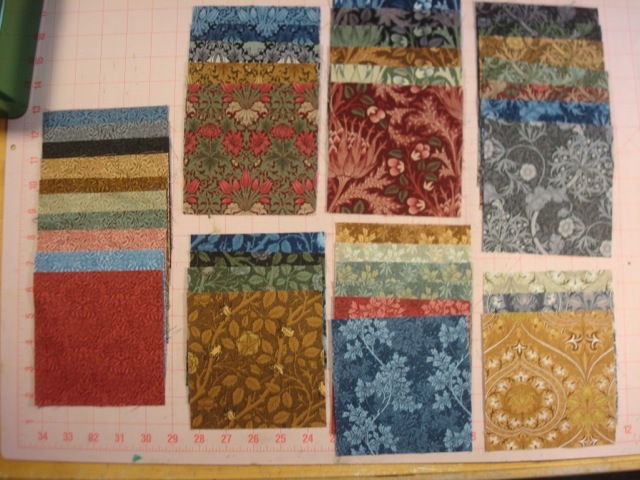 William Morris (ish) nickel squares. I will contemplate what to do with them during DaGM20… unless I change my mind. I am not a “thread snob.” I know, I should have my quilter badge taken away, but usually I don’t care what I sew with (as long as it works on my machine.) That said, I’ve never had a quilt “fail” because of the thread. But, because I’m now hanging out with actual quilters, I feel I have to upgrade my thread stash and try some new things. 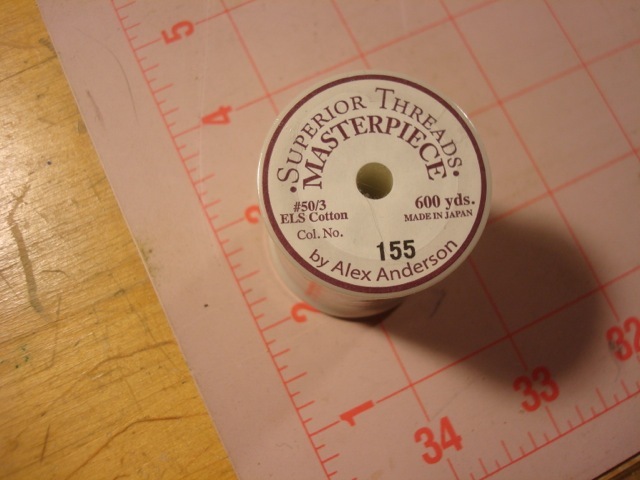 One of the new threads I decided to try out was “MasterPiece by Alex Anderson” from Superior Threads. The Storm at Sea/Roses quilt is almost ready to be put together. Well, I finally got around to testing the thread last month, and it kept breaking. I went to the web site to see if I could troubleshoot, but nothing helped. Usually, at this point, I would just relegate it to the “bad buy” category and use it in my bobbin. Instead, I wrote to Superior Threads… and they wrote me back…over Christmas! Long story short: the MasterPiece I had got on special was 2 ply. They have since switched over to 3-ply which is stronger. They sent me a free spool to try out the 3-ply, and it seems to be working great. 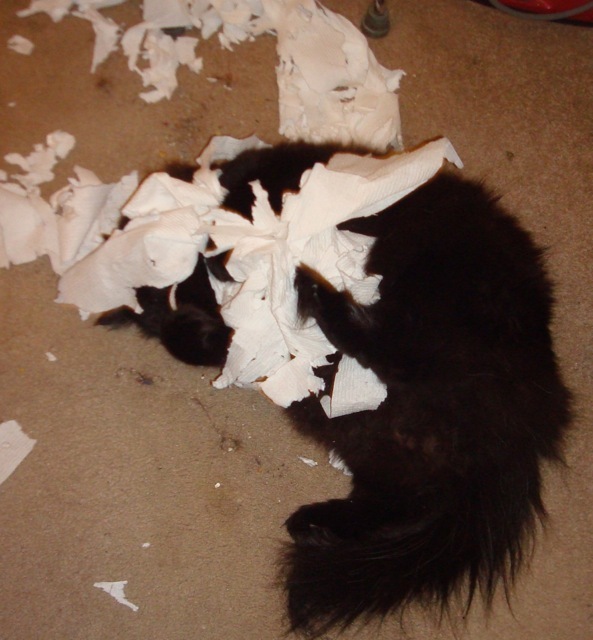 I did figure out what the problem with the 2-ply might have been, though. I was using Aurifil poly in the bobbin, and that was “cutting” the MasterPiece thread in the top, ever so often. Having cotton in the bobbin with the MasterPiece seems to help with the breakage on the original spool. So, a bit of a rave for Superior Threads and their tireless customer service folk who work even over Christmas making sure you love their threads. So Fine is still my favorite poly thread, but MasterPiece is lovely to work with…plus there’s about a 100 billion feet of thread on one of those itty bitty spools.